3 What does greatness mean? 4 What is the greatness of Shiva? 4.6 Simplicity is his ornamentation. Shiva is the formless, supreme consciousness in the highest aspect, as well as has the physical manifestation so that others could perceive the representation of Shiva. Lord Shiva is the ultimate transformer, the immortal, supreme being in Shaivism who doesn't have any start and end. Shiva is Mahakal, the infinite voidness from which everything emerges and merges back in the end. The Lord who exist in dual nature in which one is void known as Sadashiv and other is Lord Rudra which has the physical reality and known as the cosmic roar of the universe. In this post, we have explained the greatness of Shiva who is Chidanand Swaroop, Param Brahma but before that let's understand what does the term greatness represent? From the traditional perspective, Greatness is an eminent position in the culture, tribe or society. It is the state of superiority over others in a particular area. Greatness also means enjoying exceptional abilities in comparison to others. Now, we are in a state to comprehend Lord Shiva's Greatness on his physical dimension. 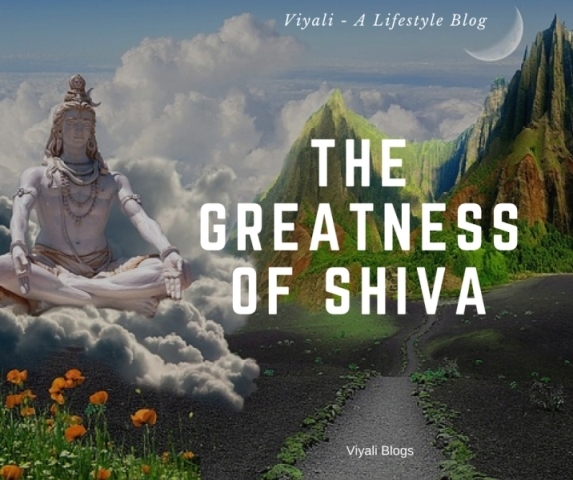 What is the greatness of Shiva? In the physical form, Shiva is the loving husband of Gauri. Shiva is the one who is in thoughts of almost every Yogi, devotee, and Lord Narayan. Lets, get started with the greatness of Shiva. Indeed Shiva never born which implies that Shiva is Swayambhoo and there is no father of Lord Shiva. Shiva is the mightiest Lord and goddess of energy known as Shakti is the loving wife of Shiva. The third eye of lord also known as the spiritual eye; It is in the middle of Shiva's forehead which depicts the administration of the Lord over the world. There are many interesting facts associated with Lord Shiva which present him as the superior Godhead. No one in this world has the abilities to define the complete qualities of Shiva, the one who is Bhavnath which means he understands his devotee's unspoken words. Shiva is Non-Materialistic in the primary nature, known as supreme Vairagi and, still, the charm of Shiva is charismatic. Adorning blazing crescent on the head, long matted hair locks flowing behind the shoulders of Shiva and Goddess Ganga resides in the middle of the hair coils. Serpent Vasuki is there at the neck of Lord coiled three times, and Shiva has the trident on his right hand. Lord Shiva is Pashupatinath; Pashu means creature and Pati means Swami, Lord. According to the legend; once Vasuki felt, he cannot bear the temperature of Kailash, Shiva wrapped him on his neck. Shiva is the most compassionate Lord who is the savior of the weaker section of the community. From demons to deities Shiva is Aradhya of almost everyone. Shiva smears cremation ground ashes on his body and lives an unconventional lifestyle which is against social rules. The rules are the medium of injustice and worldly disorders egoism, lust, anger, illusion, racism, and partiality.These rules make humanity extreme. That is happening to the world; People have become self-destructive to a specific prospect. They are destroying world peace, nature which is not good for coming generations. Shiva has shown, the excellent alternate solution of the problem by presenting him as Aghori Shiva. Aghori Shiva who is not extreme and believes in protecting righteousness. Most of the people know Shiva as the Hindu God destruction, whereas Shiva is much more than that. Shiva is Hiranyagarbha, the primary place where the creation of the world starts. Once upon a time when the deity of death (Yama) tried to take Shiva's little devotee Markande life with him, Shiva protected his little devotee and made him immortal. Shiva is Anadi who is a creator, preserver, and destroyer of the world. Shiva doesn't have any constraints attached to anything. 6 - Simplicity is his ornamentation. The thing which yogis like about Shiva is that Bholenath doesn't apply any ornamentation and lives in the state of the cosmic consciousness. Rudraksha and Bhasma are the significant ornamentations of Shiva. As mentioned above, Shiva is formless and know as Lord of the Lords. It is the highest form of Shiva and Lingam is the physical manifestation of the formless Shiva. Lord Shiva is the most authoritative phenomena, the one who lives in the highest dimensional world. Shiva is inside as well as endures outside as the physical reality. Once a demon of memory, Apasmar tried to disturb the balance of the world. Shiva neutralized him by presenting his Natraj Avatar. Shiva Loka is the highest realm in the world. It is the place which contains the several Lokas within. It is the Loka which is governed by Mahadev and Adishakti; no other one is allowed to enter within. Countless Bhairavas guards it. It is the place where every Loka gets dissolve. Even Lord Vishnu & Lord Brahma gets merged in it after the end of the Kalpantara. The greatness of Shiva lies in the name of Neelkanth. At the time of cosmic ocean crunching, everyone requested Shiva to protect them from Halahala. There is no one like Shiva who drank Halahala poison to protect the world from adverse effect and distributed nectar to others. Halahala turned Shiva's throat blue, that is how Lord Shiva got his name Neelkanth. The name Neelkanth defines the greatness of Lord Shiva. Shiva is Gyanmurti, the source of Vedas information. There are many lessons which people can learn from Lord Shiva. The art of Yoga and meditation emerged from Lord Shiva which Shiva passed to Sapta rishis. New visionaries can learn the secret of success from Shiva. In this post, We have shared the attributes of Shiva which reveals the greatness of Shiva. We invite you to like our facebook page and twitter handler to get our recent post notification. You can also subscribe Viyali blog through your email account, and it is free. Thanks, keep smiling and stay blessed.